$15,000 in prizes will be awared in the 2018 Spring Create Real Impact Contest from Impact Teen Drivers and California Casualty. Students aged 14-22 can enter their creative work highlighting the danger of distracted driving at http://www.createrealimpact.com. Helping others make smart choices saves lives. Students aged 14-22 can win their share of prizes and help prevent needless tragedies with the 2018 Spring Create Real Impact contest from Impact Teen Drivers and California Casualty. 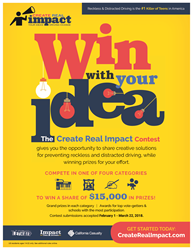 Entries of empowering creative solutions to stop distracted driving are being taken now through March 22 at http://www.createrealimpact.com. New research concludes that merely handling and looking at a hand-held device doubles a driver’s risk of being involved in a crash, yet thousands do it every day. That’s why the Create Real Impact contest is so important. The Create Real Impact contest was initiated in 2009 as a proactive solution to the deadly epidemic of inattentive teen driving. Unfortunately, there has been a dramatic increase in U.S. traffic fatalities the past three years after a decade-long downturn. Sadly, the National Highway Traffic Safety Administration finds that the largest proportion of drivers involved in deadly distracted driving crashes continues to be teenagers. Students aged 14-22 can enter and find motivation from past winners at http://www.createrealimpact.com. The deadline for submissions is March 22. Online voting will take place March 23 through March 28, with judges determining grand prize awards by March 30. Winners will be notified around April 2, in conjunction with National Distracted Driving Awareness Month. Headquartered in San Mateo, California, with Service Centers in Arizona, Colorado and Kansas, California Casualty provides auto and home insurance to educators, firefighters, law enforcement and nurses across the country. Founded in 1914, California Casualty has been led by four generations of the Brown family. To learn more about California Casualty, or to request an auto insurance quote, please visit http://www.calcas.com or call 1.800.800.9410.